That’s my number of different veggies I ate yesterday. I suppose it could be more if I counted the corn chips, but since I’m not Congress (who counted the smear of tomato sauce on cheese pizza as a vegetable), I don’t. Today I’m sharing my day of food for WIAW, but don’t forget that tomorrow will be all about Hailey’s meals and is also the Munchkin Meals link up. Please snap your pictures and join in! I’ve lost my desire for coffee lately and instead am enjoying green tea in the mornings. It satisfies my craving for something warm to sip on while I do computer work and it and the Juice Plus gummies hold me over until Hailey is up and I can make breakfast. Yesterday’s breakfast was awesome. I am deeply saddened that I’m out of avocado today. 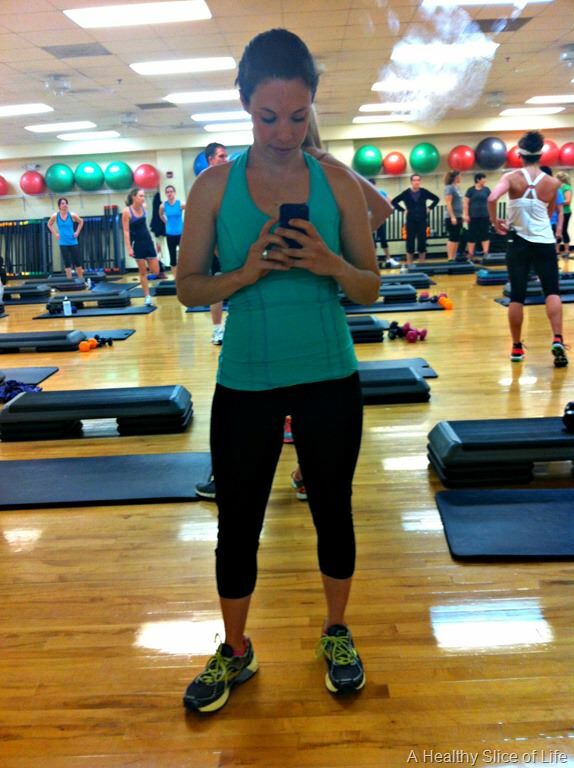 I took a cardio strength class in the morning that I needed after quite a few days with no weights. I still feel like an exercise class newbie, which explains my attempt at a stealth photo. No need to draw attention to myself! Back at home began my typical day of continuous mini-meals. 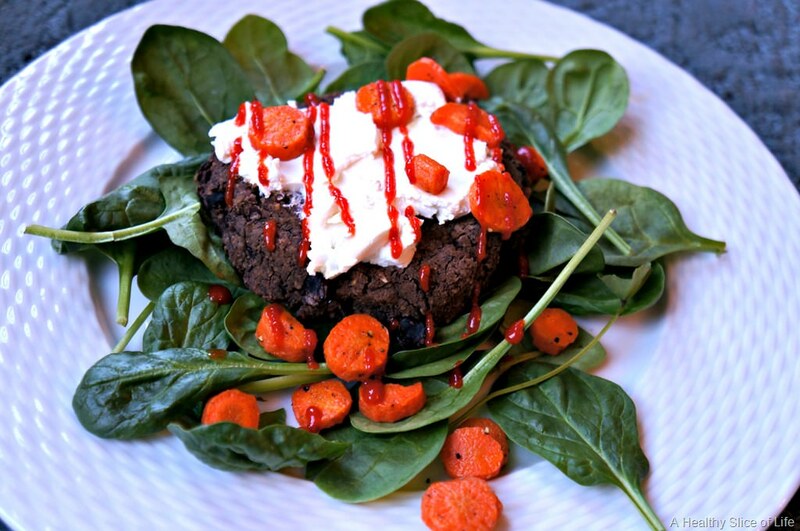 Baby spinach, roasted carrots, leftover black bean burger, La Bonne Vie spreadable goat cheese that I’m loving lately and… more Sriracha. With my weekly prep, these meals come together really quickly, but I still was needing another snack after my 3 mile afternoon stroll with a friend. I could drink Jack’s salsa. Have you ever had it? If not, you must try it! Dinner came together quickly thanks to David manning the grill. It’s still a little too chilly to eat outside, but we’re so close I can taste it! I think might be corn… or pizza… or steaks… or onions. Totally stealthy photo! I ‘pretend’ take pictures all the time out in public as to not draw attention to my foolishness! Erica recently posted..The End of Happiness. I have an egg sandwich for breakfast pretty much every day. I try to stick some spinach in the egg to get extra veggies. Not quite warm enough for grilling yet, but I’m eagerly waiting. Pizza on the grill is great! We grilled some garlic balsamic pork chops last night. They were delish! Your breakfast looks amazing! 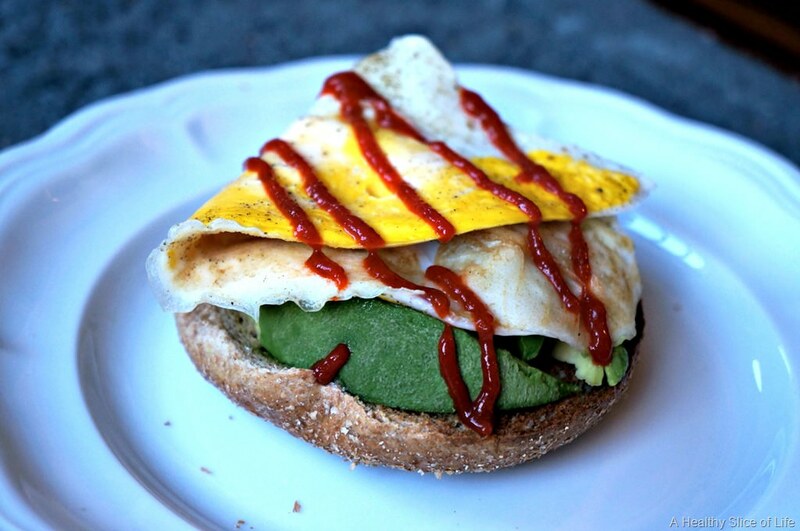 There is really nothing better than combining toast, avocado, and fried eggs. I am loving your addition of sriracha, too :). You look so good mama! We love grilling veggie burgers and any type of veggie. Yum! In this meals you have posted, I noticed that you only had three carb servings for the day. 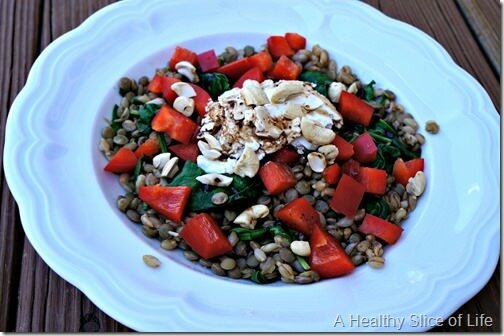 The other little meals of your was full of protein and veggies/fruit. Which is great in my opinion. I still have not tried Sriracha! I know, get with it right!?! We’ve been grilling more as the weather becomes more spring like. We love it! Last night we had grilled tequila lime shrimp with roasted veggies. One of our favorites is grilled quesadillas. A fun bbq/party meal since you prepare all the fillings then everyone can create their own quesadilla! I’ve had it in my fridge for a long time, but only recently jumped on the sriracha bangwagon. 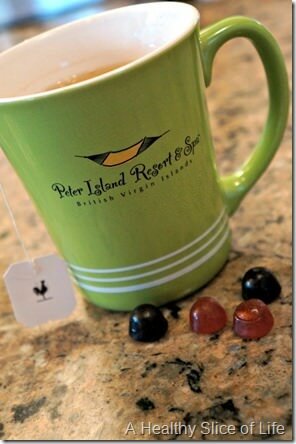 Let me be the one to invite you aboard- it’s delicious! 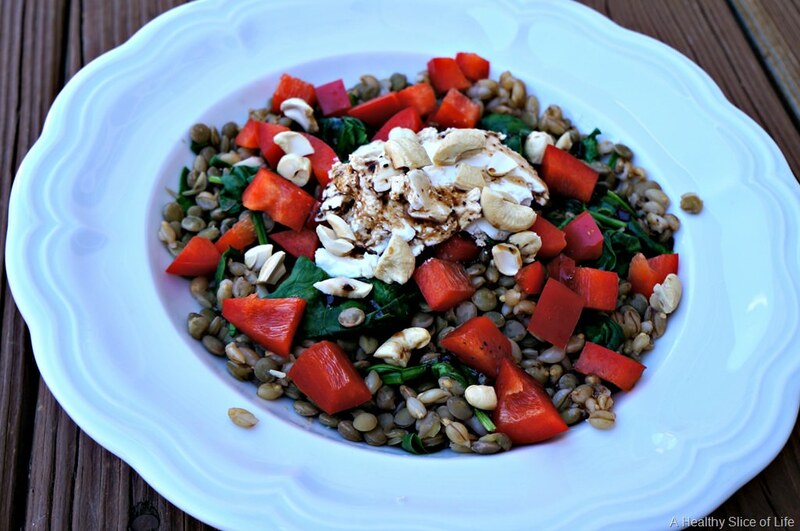 Mmm, we had a similar lentil salad… so good! It’s kind of grilling weather year round here, which ironically means we don’t use it as often as we should… might have to grill this week! I love grilled red bell peppers and zucchini. 20 minutes from you?? Can I come visit and we can go and stuff our faces with delicious salsa together?! 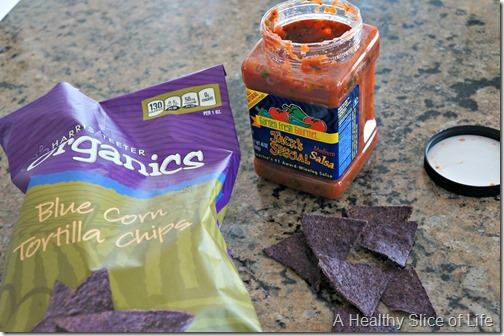 Local salsa always taste so much better than the store brand – I have a favorite brand here that you need to try! Oh and as far as grilling: burgers. I’m a traditionalist. hmmmmmm…. 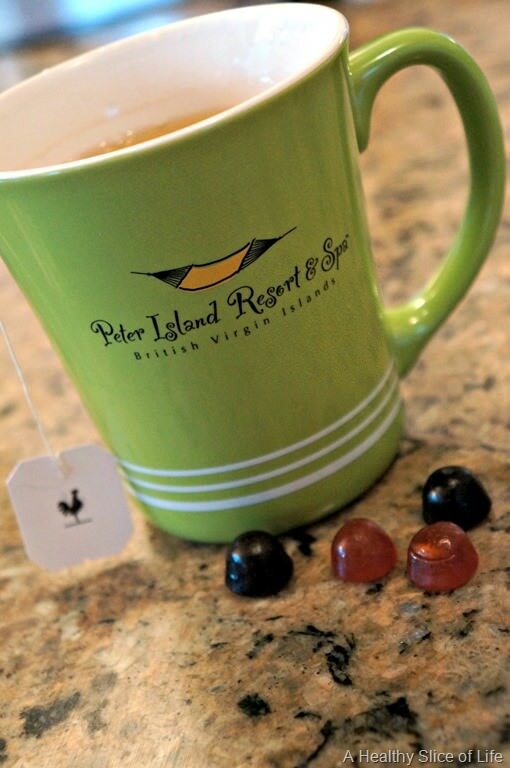 where at the outer banks?? I wouldn’t call them close, but maybe not too far?!? But I might be flying in to Raleigh this time and staying there one night! 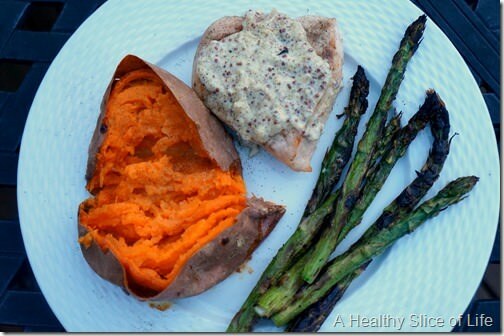 That sweet potato looks perfect! I love grilled food, my favorite is my stepdads lamb and mixed vegetables. We grilled for the first time this weekend, too. Though, we’re in Ohio, and it was definitely not warm enough to eat outside. My little guy must remember eating outside, because he keeps climbing up on the patio table and signing “eat” and yelling “daddy cook”. My sentiments exactly, buddy! Love grilled veggies and even fruit – banana in foil with chocolate in the middle! Haha! Love your stealth photo. You are a braver woman than I 🙂 Great meals too! I say this with genuine jealousy: I wish I had an appetite big enough to eat that many yummy healthy foods in a day. I have digestive issues and so often have this weird lack of appetite. I feel like so much of our foods go to waste and I miss getting to create new and unique recipes! Those meals looks ah-mazing! Mmmm all of your meals look so good; that black bean burger looks like heaven..ive never tried one of them before! Look delicious though! Goodness, favorite thing to grill?? Steaks, burgers, pizza, fruit … you name it! I can’t wait for it to get a little warmer so we can start grilling out again! Kristen @ notsodomesticated recently posted..39 Weeks: Our Big Decision. Delicious day! I need to refill my propane tank so I can fire up the grill! Will you come cook for me? Pretty please? I can’t wait to go over to my parent’s house to grill this summer! We typically do steak and seafood with the occasional tofu or homemade veggie burgers. Your breakfast looks absolutely delicious! I think I’ll have to try it out tomorrow morning! Danica @ It’s Progression recently posted..Numbers: Friend or Foe? 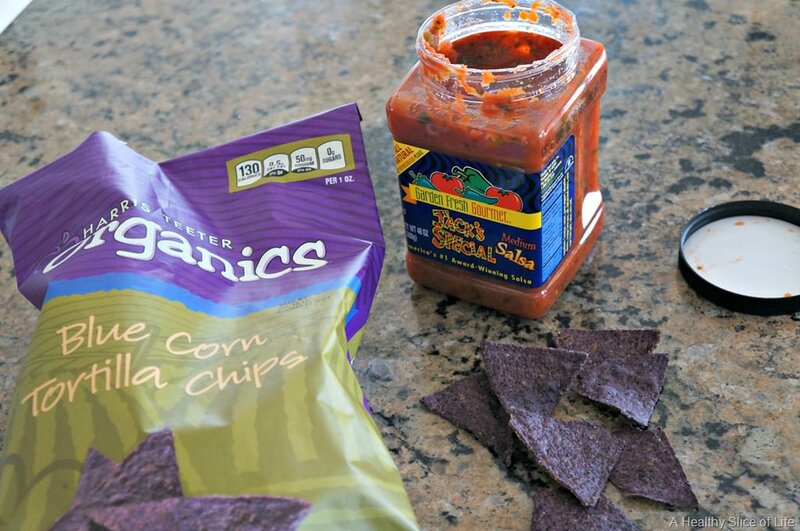 Ok, I need to know WHERE you got that humungo thing of Jack’s salsa and for how much. I swear we get ripped off in Canada. I pay an arm and a leg for that crack….I mean, salsa. I got it at Harris Teeter! It’s not exactly cheap ($5.99 maybe?) but we LOOOOOVE it! !